What is it about runners and photos? I lose more items than I save but I have not yet lost the photos of myself spanning my years in the sport. In my way I find it helpful to have a record of both the good races and bad, something I can turn to when I’m looking for answers or inspiration. That is, the good photos of those races. I guess that is where the vanity comes in: when you come home from the race, see the photo on Facebook and either untag yourself or make it your profile picture. Digital photography brought with it the option to buy photos of ourselves crossing the finish line or on the course or looking like some wild animal in the finish chute. Race organizers working with professionals such as Swim Bike Run Photography founder Brian Knight; runner-photographers like Cheryl Young; and running club photographers like Dan Reichmann started offering race photos, too – free ones. Their job is both artistic and physical: that of zooming, focusing, pointing, and clicking for hours on end as they try to capture not only an image – a keeper, a memorable image – of every single participant. Meanwhile, there are photojournalists like Sarah Voisin, with The Washington Post, who encounter the running scene on occasion and put in their own long days seeking out the images that best capture the essence of what happened. RunWashington wanted to learn more about the personalities behind the camera: things like how they approach an assignment or tackle the challenge of taking photos of people who are in fact moving while wearing weird clothes. And especially for Young and Reichmann, for whom this is an avocation, we wanted to know what keeps them coming back for more? I was struck by something Reichmann said. He is under the impression, if you can believe it, that the “vast majority” of runners do not look at the photos he takes of them. Oh, Dan. Trust us. They definitely look at your photos. They had different objectives. Elvin Funez was there to run. Sarah Voisin was there to work. Still, Voisin says, “we were a team.” She was there, in the hours before last year’s Marine Corps Marathon, not only to get early morning photos of nervous runners huddling, twitching, focusing, relaxing, and calming themselves outside the Pentagon metro station, but to support Funez, her husband, in his fourth marathon. Voisin is a journalist who covers all types of assignments. This year her primary assignment for the Washington Post has been to travel to Cuba to capture a new era of U.S.-Cuba relations. “I do, however, appreciate how sports assignments sharpen your focusing and response skills for documentary photography,” she says. And when it comes to covering running, Voisin is most interested in capturing the prerace atmosphere. “I believe the best photos from any assignment, whether it is a marathon or presidential debate, always come before and after the official event,” she said. As a herd of people walked towards the starting line (you see their backs), Alexandria’s Tracy Curtis stood there, separated from the herd, facing the opposite direction, smiling, gazing, dressed “in a warm pre-race bathrobe.” Her gloves were pockets. Sunlight was in the early stages of replacing darkness. And, somewhere off in the distance, some source of bright-blue light beamed toward her, making her look angelic, as if she was planted there. What style! But priority No. 1 for Voisin was supporting Funez. She met him at three different points in the race. Her Fitbit recorded more than 10 miles of walking. Knight, like Voisin, covers a variety of assignments, though he specializes in endurance sports events. Back in 2000, Knight helped produce an adventure race in western Fairfax County. Among his many duties were serving as a webmaster and photographer. And when the race ended up spawning the adventure race group EX2 Adventures, Knight stayed onboard for another five years. Since then he has upgraded both his equipment and overall technical skills. On the skills side, Knight spent two years – what he describes as an unpaid internship – working with a photographer who specialized in covering adventure races as well as trail runs, mountain bike races, even off-road triathlons. Today Swim Bike Run Photography covers some adventure races, but specializes more in road and trail races, triathlons, and, as of late, high school cross country races like the recent DCXC Invitational in Northeast D.C. Knight typically assigns one photographer to cover the finish line and post-race photo booth, a feature that has become a hit at many local races, while he gets out on the course. Knight’s assignment is different than a journalist’s in that his job is to capture a photograph of every single participant. Some courses and events make this easier to do than others. How about covering a race in freezing rain or hanging off the side of a boat in the Potomac River for the Nation’s Triathlon or sitting on the back of a motorcycle as it zooms around the course? 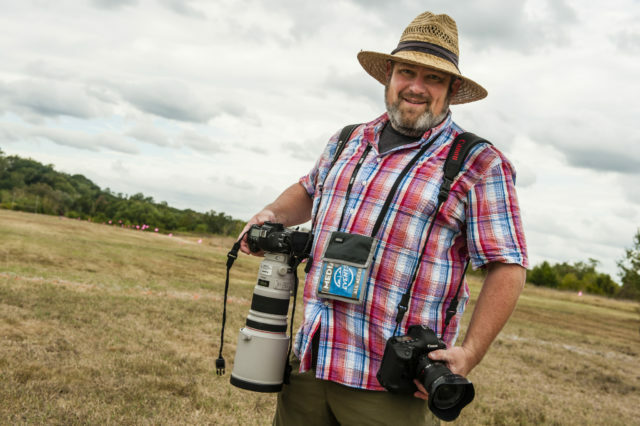 Typically seen wearing a big, floppy hat and lugging around an assortment of cameras and tripods, Knight can be found at events hustling around in search of the best light to capture participants (which, as it turns out, is a loaded way of describing his job). If Knight had his choice, every race would either start or finish about an hour before sunset, ideally in the spring or fall: peak light. “It really makes the photos pop,” he said. But perhaps his biggest obstacle is gravity. “Gravity does weird, terrible things to the human body,” he said. Knight does his best not post those photos on the Internet. The child who in one frame is running – no, he is flying, with both feet off the ground – and has a big smile. In the next, though, as his feet slam back towards the ground, he looks old enough to quality for Medicare. “I will never post these photos anywhere,”Knight said. By now, if you run a Montgomery County Road Runners Club race, your mindset is: photos of me are part of the deal. That requires someone behind the camera, and in this case maybe that person’s son, too. Enter Dan Reichmann and his 9-year-old son, Alex. Dan took photos at the Piece of Cake 10k in 2011 and since taken over for Ken Trombatore as MCRRC’s lead photographer. Alex got his start two years later, at 7, the year he was strong enough to hold a camera. Dan said he had been a “hobbyist photographer” for most of his life and took to it more after digital photography made the craft more accessible and less expensive. Though a Boston Marathon qualifier himself, Dan refers to his wife and MCRRC Racing Team member, Lisa Reichmann, as the competitive runner in the family. At an MCRRC race, Dan went to photograph Lisa and met Trombatore in the process. Dan says he can do without the cold weather that gives him “frozen trigger fingers.” He also prefers the smaller races that “allow for more individual focus on each runner.” Approaching runners sometimes hear him wish them luck or ask them to smile. The runners, in turn, appreciate his effort.Some thank him as they run by. They wave, raise their arms up in the air, do the click-the-heels jump, or hug their running partner. If Dan is working by himself, he prioritizes the start and finish. When Alex or another photographer comes along, someone takes photographs out on the course, too. And for larger races such as the Parks Half Marathon, Dan assigns photographers to specific locations on the course. Capturing every runner makes for a long day at the races. There’s yet more work to do when Dan gets home, as he uploads the photos, deletes the really bad ones, and tries to get them up on the MCRRC website as quickly as possible. But Dan enjoys the process, and the time he gets to spend with Alex. See years of MCRRC race and program photos at www.mcrrcphotos.com. I know how you love taking photos of your running friends. These were the words of Cheryl Young’s husband, in 2007, when he bought her a DSLR camera. “I kind of laughed,” said Young, a dedicated member of Capital Area Runners. “I mean, I loved finding running photos of me, but okay. Soon after was the women’s Olympic marathon trials in Boston. Young traveled there to cheer on her teammates, Kristen Henehan and Lisa Thomas, and for the first time tried her hand at photography. “I did the same thing at the Marine Corps Marathon and it just took off from there,” she said. Young has since taken photography classes and bought new equipment, and photography has strengthened her connection to the running community. Before Young got into photography, an injury would have kept her on the sidelines. Or maybe not. Seeing people running would make Young miss it too much. Now, if she is injured, Young is on the sidelines. She seizes the opportunity to cover more events. Before races, Young studies course maps and looks for a nice backdrop. At the Navy Air-Force Half Marathon, for instance, she photographs runners as they enter and exit Hains Point. The sun is in the runners’ face in one direction, behind them on the other, requiring different setting. And it’s still pretty dark when the race starts. She bought a new lens, in fact, with this race in mind, and was pleased with the results. Young tries to capture as many photos of as many runners as she can, but her main task is to cover CAR members, who run a variety of paces. “As the crowd gets thicker, it gets hard to spot many of the runners,” she said. Sometimes her CAR runners even get photobombed (sorry, Patrick Rainey), but that doesn’t faze Young, either. See if Cheryl Young got a picture of you alongside one of her CAR teammates at www. youngrunner.smugmug.com. This article originally appeared in the Winter 2015 issue of RunWashington.